The whole world is watching Wall Street today. It's no secret that if the banking system goes into any kind of convulsions, the arts groups that depend on serious funding from corporations and private donors could be up a creek, like almost everyone else. L.A.'s Center Theatre Group – headed by Michael Ritchie – administers three mid-size theaters out here: The Ahmanson and the Mark Taper Forum, both situated in the Music Center's county-owned downtown plaza, plus the Kirk Douglas Theatre, about ten miles west in Culver City. It would seem CTG got to the bank just in time. On Sunday, the press opening to John Guare's 1971 farce The House of Blue Leaves marked the official reopening of the Mark Taper Forum, after two years of dormancy and a $30 million redesign. Female patrons were particularly delighted by the opulent new women's bathroom and its 16 stalls, upping the odds that theater-going femmes now stand a chance of making it back on time for Act 2 -- no small accomplishment in days of yore, when there were only four stalls for 750 patrons, presumably half of them women. There was still a small line on opening night, but nothing like before. The facility now has elevators between the upper loges and parking lot that never existed before. Most of the perks, however, are for the technicians creating the shows. When Gordon Davidson ran the place, the entire set for Tony Kushner's Angels in America had to be cut down to fit through a 4' by 9' loading door, then reconfigured on the other side. In a thoughtful essay in the L.A. Times, Charles McNulty suggested it would be peevish to respond to this investment with anything other than gratitude. The Taper has been promoting its facelift with banners running all along major city thoroughfares that proclaim “Act II: The Opening of the New Mark Taper Forum.” The symbolism -- with Mr. Ritchie having now settled comfortably into his difficult post as Gordon Davidson's successor -- is very clear: This is a new era. Then, the difficult question: A new era representing what? I don't know, and I'm an avid scene watcher. It struck me as odd that a new era should be launched with the revival of a domestic comedy that was a favorite in the regional theater circuit, and then the college circuit, in the '70s. Guare's farce looks gorgeous in the newly minted theater. The investment in the building honors the work on the stage. This work, however, doesn't quite reciprocate. It does pack fire on many occasions, and that fire is fueled by the dynamic interactions between John Pankow and Kate Burton, as, respectively, Artie Shaughnessy – a Queens zookeeper who's also a very aspiring songwriter -- and his profoundly medicated wife, Bananas. He shows a cavalier and abusive disregard for his wife – by flaunting his mistress, Bunny Flingus (Jane Kaczmarek), and making no secret of his plan to have Bananas institutionalized while he and Bunny realize their dreams together in California. Burton's Bananas is this production's centerpiece, while the world's vainglorious insanity swirls around her, which is Guare's point. Burton answers that question of why do this play now with her pained expressions and wry comportment – Bananas has come come through shock treatments and must continue, with as much dignity as she can muster, to endure life's torments and insults to her obvious intelligence at the hands of the maniacs who govern her life. The farce is set in 1965, when the Pope was visiting New York, yet Burton propels its significance forward to the election cycle of 2008. Everyone but Bananas worships fame, but here that's largely beside the point – which is vicious and rabid personal ambition while the world skids off its tracks, stock market included. I shouldn't bring up Sarah Palin, but why not? 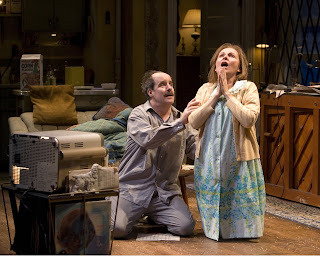 Nicholas Martin's production suspends dark blue drapery over Artie's grimy Queens apartment (The set by David Korins.) This frames what's supposed to be an emotionally ribald play with a tempering ornateness, which may be partly responsible for blanketing the farce that's supposed to be literally explosive. Instead, the comedy feels at a remove, more amusing than hysterical, and more sad at play's close than horrific. Martin's staging of Blue Leaves shows how, in a play largely about grime, the over-abundance of resources can have a smothering effect. Even so, better that CTG, and arts orgs in general, have resources to misplace than the alternative. Out here, the alternative is solo shows and two-handers on bare stages. In mid-size theaters , they can look awfully sad. Necessity is not always the mother of invention, and this is a determination that Wall Street may well influence this week. Not to be too picky, but the Ahmanson has a capacity of 2,100, making it more than a "midsize" theatre.